Preheat the oven to 425 degrees Fahrenheit. Line a baking sheet with foil. Combine the olive oil, sweet potato, carrots, parsnips, onion, garlic and thyme in a large bowl. Season vegetables with salt and pepper liberally then spread across the prepared baking sheet. Roast until the vegetables are tender and turning golden brown, around 40 minutes turning halfway through. Mix all of the vinaigrette ingredients in a small bowl. 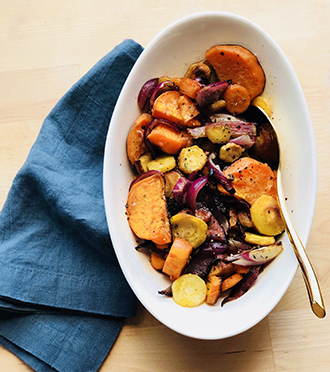 Transfer roasted vegetables to a serving dish and toss with the vinaigrette.